Can you have it both ways? It looks like Jose Marchi indeed can. In this stunning show, Marchi creates nearly wall length triptychs that cohere as one visual work. The three canvases evolve from objects/reality in the first, towards paint/idea in the last. 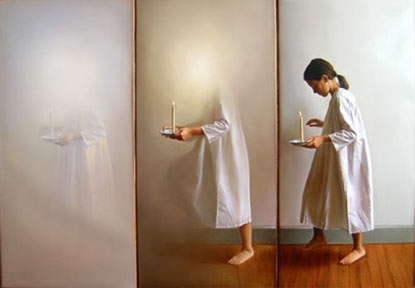 The first work in each series is a breathtakingly executed realistic image of mostly female figures--not corny nudes, but women engaged in mysterious actions in spare geometric spaces where floor molding, wood floors and walls set up an underlying visual geometry as meticulously conceived as the figures themselves. In the middle painting of each series, figures seem to fade so that our attention is drawn away from the jaw-dropping verisimilitude and narrative intrigue, to the shapes and gridded architecture of the space containing the figure. In the final canvas, there is only the geometry, the same suggested in the first hyper real painting, but now set up as paint and shape for its own sake. In doing both these things so well, our awareness is heightened that architectonic structure underlies the most detailed worldly observations (Latin American Masters, Beverly Hills).